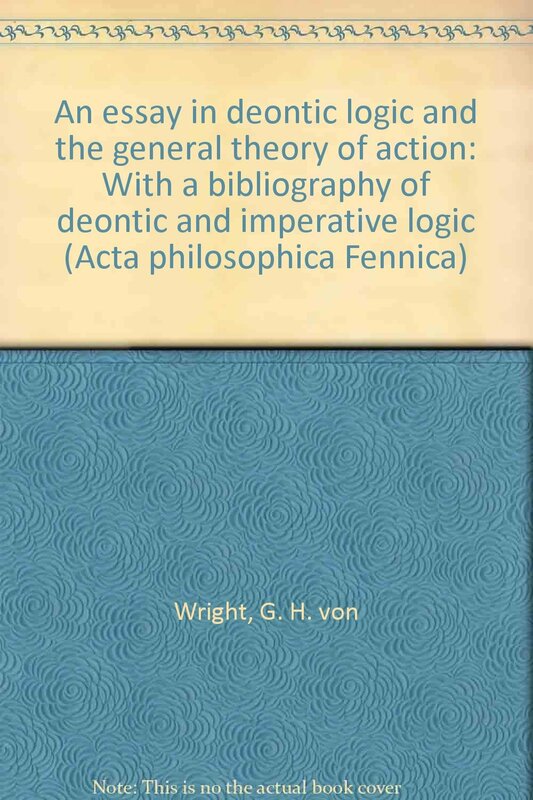 An essay in deontic logic and the general theory of action: With a bibliography of deontic and imperative logic (Acta philosophica Fennica) [G. H. von Wright] on Amazon.com. *FREE* shipping on qualifying offers. An essay in deontic logic and the general theory of action : Acta Philosophica Fennica Fasc XX1 1968 [georg henrik von wright] on Amazon.com. *FREE* shipping on qualifying offers. An Essay in Deontic Logic and the General Theory of Action: With a Bibliography of Deontic and Imperative Logic, Issues 21-22. Front Cover. Georg Henrik Wright. North-Holland Publishing Company, 1968 - Act (Philosophy) - 112 pages. An essay in deontic logic and the general theory of action. : With a bibliography of deontic and imperative logic. Imprint: Amsterdam : North-Holland Pub. Co., 1968. Physical description: 112 p. ; 25 cm. Series: Acta philosophica Fennica ; fasc. 21.